Nathan (27) and Jasmine (24) took over the tenancy in April last year and have worked hard to bring tasty offerings to the table. It was a busy Thursday ‘steak night’ when Nick and myself visited and we noticed that the pub is dog friendly. Jasmine greeted us cheerfully and took us to our table in the conservatory. Working alongside her that evening was Katie. We were in good hands. A concise menu made choosing easy. To begin, we shared a scrumptious Thai fishcake with sweet chilli and mixed leaf salad. The sauce was tangy and I wanted to lick it off the slate, but manners prevailed. 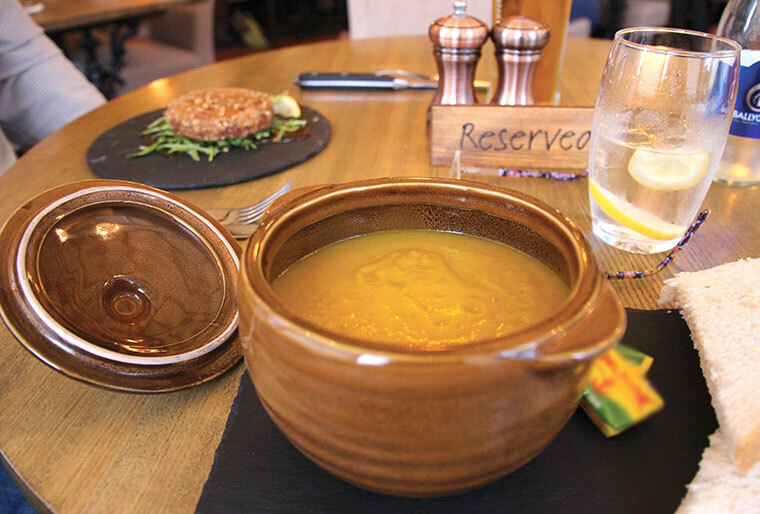 We also shared a homemade vegetable soup with unusual smoky notes of paprika, and rustic white bread on the side. 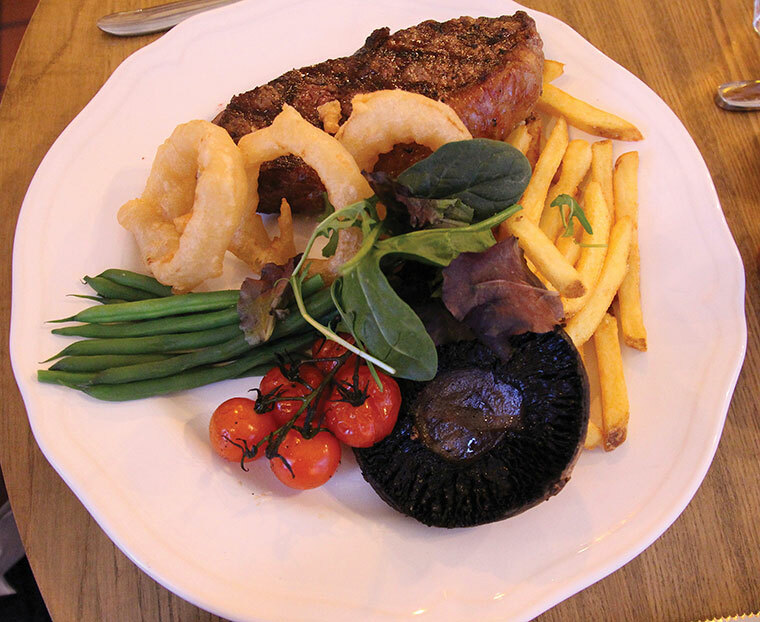 Next came a sirloin steak for Nick served with tomatoes, onion rings and chips and when I saw the size of the mushroom, I thought ‘what a fungi!’ as mushroom envy took hold. The steak was medium rare to his request and in his words, “perfectly cooked, juicy and large.” He had declined a sauce, an extra, preferring mustard instead. 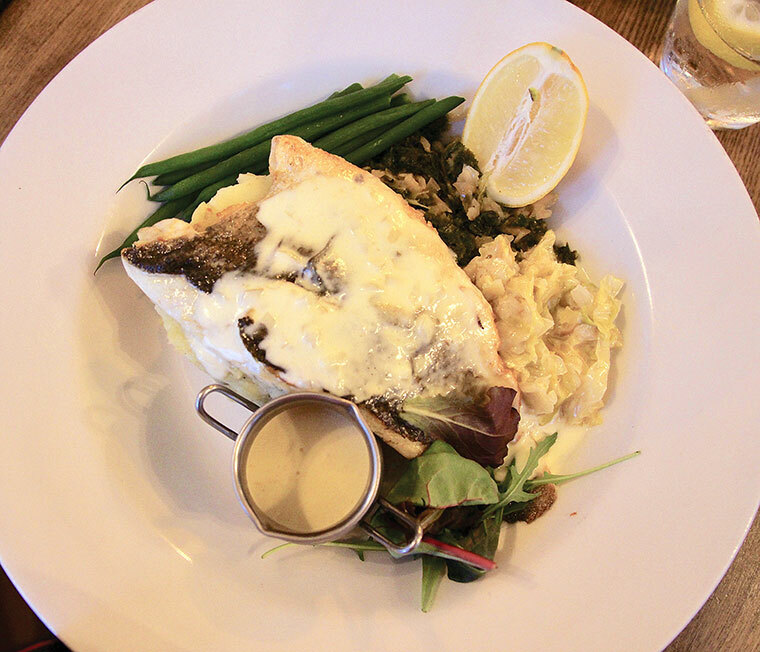 In contrast to the red meat, and that lovely dark mushroom, my white, Pan Fried Fillet of Sea Bass with crispy skin, which lay a-top crushed new potatoes, and included creamed cabbage and braised kale, was a delight. A white wine sauce tied everything together to make sheer deliciousness and crunchy green beans added texture. dilemma I had too much trouble with. Even so, I dearly wanted that plump mushroom off Nick’s plate, and was confident he would leave it because he rarely eats mushrooms. But by the time I got round to asking, he had scoffed the lot, saying he really enjoyed it. He even ate the onion rings, which are not a favourite of his and there wasn’t a chip left in sight. Listening to the background music whilst waiting for dessert, we admired the conservatory restaurant. 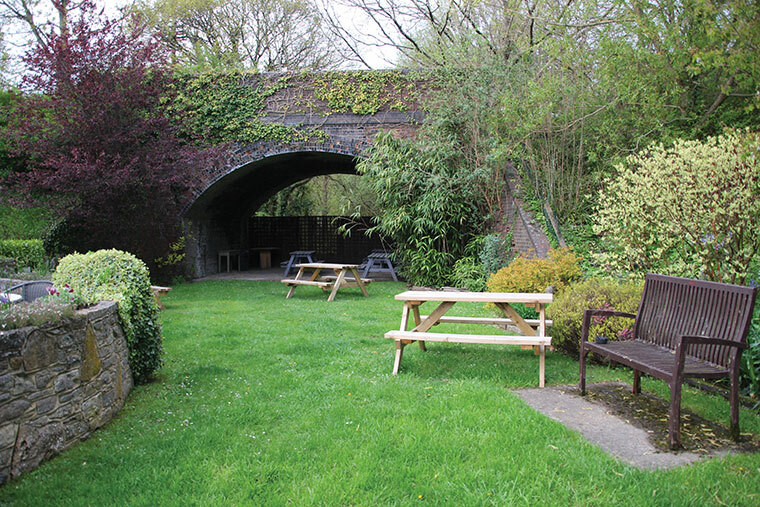 It seats around 30 diners and overlooks a large and beautiful garden. There is an adjoining room, seating around 15, and more tables in the rest of the pub. Nathan and Jasmine welcome large parties and on the night we visited, a jubilant cricket team from Ferndown were celebrating a win with a well-earned meal. 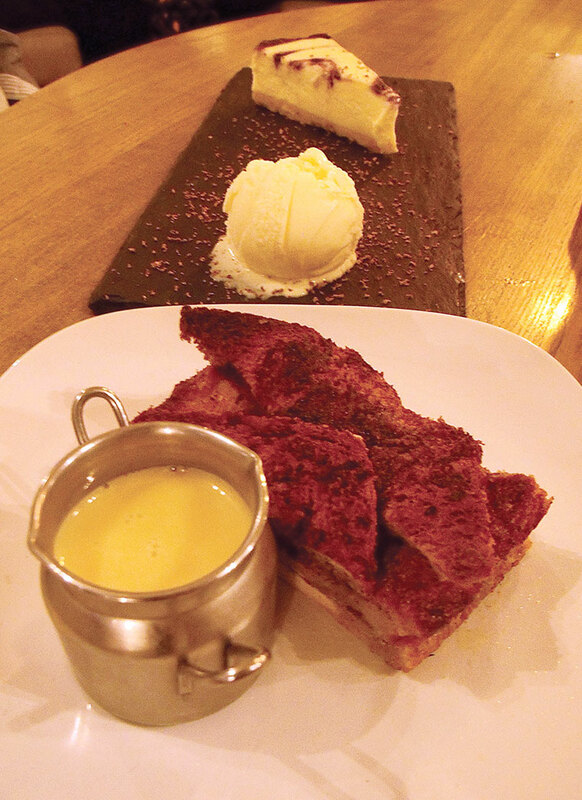 Along came the Vanilla Cheesecake and Ice Cream and my pièce de résistance, Bread and Butter Pudding and Homemade Custard. The aroma of the custard was tantalising, as was the taste, and it complemented the crispytopped dessert, which was generously sprinkled with cinnamon. Nick’s cheesecake got the nod of approval. The thick texture paired with a light, crumbly crumb-base was perfectly balanced with ice cream. He made short work of eating it. Food days at the Albion are Wednesday to Sunday. They are naturally popular. Friday is take-away day when fish and chips, burger or scampi can be ordered to take home. Tuesday is quiz night, with up to 60 people attending. Sixpenny Best and Sixpenny Gold are the locally brewed beers from Sixpenny Brewery at Cranborne, and they go down so well that guest ales only make an appearance on Friday, Saturday and Sunday. The Albion has the Cask Marque and Guinness Accreditation. Nathan and Jasmine also run All That Jazz events, and provide venue dressing for weddings, birthdays and outdoor events. I mentioned they were hardworking, and they really are. All credit to this young couple for taking on the Albion and bringing variation to a much-loved local pub. Oh, and if you expect to see Mary Nixon, she is still there. She maybe the oldest employee at 80, but she has been at the Albion for many years and lifts the spirits of many regulars.